For years I have been talking about the importance of high quality nutritional supplements are in our diets. 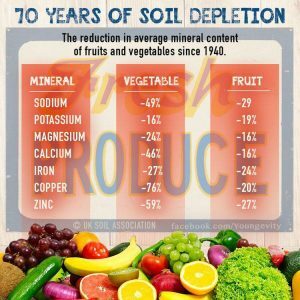 The main reason is that our soils are depleted of minerals that we need. 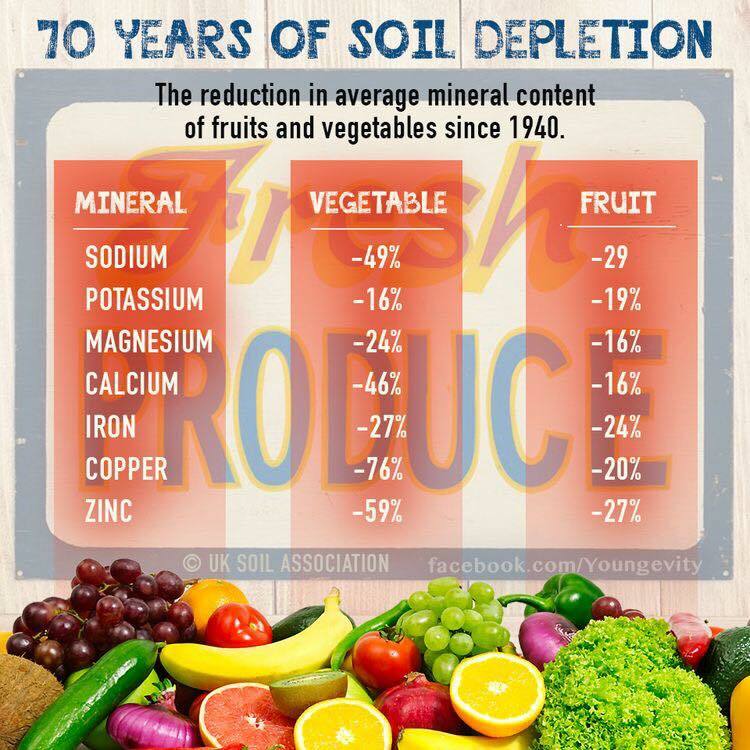 This graphic shows that our vegetables and fruits no longer contain these valuable minerals because our soils don’t have it anymore. Our soils are where our vegetables and fruits get their minerals in the first place. Many years ago, our soils where richer in mineral content because we did not have dams that kept the minerals away from farm lands. Farmers also rotated crops and then burn part of their fields so they could grow again the following year. Burning a field brought ash into the soil and replenished mineral content of our soils. This method also made it easier for our vegetables and fruits to uptake the minerals. Since dams were created and crop rotation does not happen any more, our fruits and vegetables don’t have the mineral content they used to have. That is why a high quality nutritional supplement is so crucial to fill the holes that our foods leave behind. Youngevity’s Healthy Body Start pak comes a prehistoric plant source that fed the dinosaurs. It gets its rich mineral content from volcanic ash. Youngevity found this rich prehistoric source in a mine. The plant matter was preserved by humic shale that kept the potency of collodoial minerals in tact. Youngevity mines the plant matter. Purifies it and puts into liquid or powder form so that it is 98% bioavailable for your body. This product is called the Healthy Body Start Pak. It contains 60 minerals, 16 vitamins, 12 amino acids and 3 Essential Fatty Acids. Youngevity’s vitamin mineral complex viability was my breakthrough for my energy that I lost during my original weight loss. But I would not have noticed the effects so quickly, if I did not released toxins from my original weight loss. Ketosis burns fat, and fat release the toxins from my body. Now, I am not the only one in my family who has benefited from the Healthy Body Start Pak. My whole family have seen improvement in their health. Be whole again by eating healthy and take high quality nutritional supplements that you cannot get in our foods today. We cannot help that our soils are depleted. But, we can do something about our health by taking a quality nutritional supplement like the Healthy Body Start Pak to subsidized what our foods cannot give us. For more information on what you are missing click on Missing Minerals. You can see what is in the Healthy Body Start Pak by going to this link. Don’t forget to do the Health Survey, because everyone is different, and you will find out what you need.